I think I have said the essential about what I consider ought to be known for the methodical re-establishment of this painting-object, which is the sole positive response that can be given to the battle-cry 'The subject to the scaffold'. Now I would like to show that the rigour of its principles and the use of its rules are not, all the same, lacking in flexibility; that they offer to the painter, once he possesses them to the extent that he can apply them without having to think about them, different modes of expression which are not to be despised. The present infatuation with what is called, among other things, non-figurative painting tends to accept everything that evokes no figurative memories as an authentic manifestation opposed to the subject. I have tried to warn against this illusion by pointing out that the mere disappearance of the subject is not of itself enough to change the naturalist position in any way, since the subject can be clearcut as it was in the sixteenth century, or it can be ground into dust through its decomposition into atoms, or, again, it can be represented by geometrical figures and by intellectual ideas. What needs to be done is truly to work on the substance of painting, to make of it its object - through the body to go towards light. But if the object, through its natural reality, is independent of subjective perceptions and opinions - if it is, itself, above all, the painting-object, which obeys only the laws of its own nature - then it has its own existence, independent of the reactions it can provoke in the subject, in the person who, through his eyes, enters into contact with it - and, in the first place, in the painter who is realising it and whose imagination is constantly awoken in the course of his work. When we see clouds pass in a turbulent sky, is it not often the case that we glimpse, one or other of us, strange images in these clouds, images which evoke familiar figurative memories, animals, or people, signs which are suggested to us, with greater or with lesser clarity, by our imagination? At the junction of certain masses, or of certain lines - lines which are born uniquely from the game of melody and of counterpoint to which the development of the images is tied - our taste for analogy sometimes, insistently, raises up mirages which belong, uniquely, to ourselves. Ought we to hold the clouds responsible and accuse them of betraying their object? Do they, because, all of a sudden, our memory gets the better of their real existence, cease to be themselves? It is not only in the sky that this subjective phenomenon may be remarked. Every moment of the day, we are presented with examples - in roots, tree trunks, puddles, stains, curious stimulants to this propensity we have to turn from reality to the sideshow of our dreams. Is this a bad thing? Is it a good thing? It is a simple fact which we cannot avoid when the occasion presents itself. It is itself a natural fact which changes nothing with regard to the object, its nature, its reality. Let us take it into account and use it to our advantage. We should not refuse what accident can offer; we should learn, by making use of its principle, to transform the accidental into the willed, for the sake of certain needs to which we ought to be in a position to respond. The great current fashion for non-figuration has, naïvely and prematurely, put a stigma on everything which, in a painting, could possibly suggest the idea of an image. So long as appearances are saved, that is all that is required, and, for many, that is the end of the problem. I think it would be better first to come to an agreement as to what is meant by 'image'. There is between naturalistic figuration and the suggestion of an image a difference that is irreconcilable. The naturalistic, classical, Humanist figuration is at once the base and the summit of painting dependent on the subject. But the suggestion of an image, whether accidental or willed, is something that is external to the painting realised in its object. I have just explained this, and will not insist on it, it is so obvious. But I suspect that this fear of figuration may, in the last analysis, be just a cover-up for an inability to break free of the classical method. Its elements are kept and its more healthy consequences, those which render it more susceptible to control, are suppressed: 'Hide this breast that I must not see.' ! That is certainly what 'abstract art' is all about, since 'to abstract' means simply to take from a whole one or two of its characteristics. So, are 'abstract art' and 'non-figurative art' not justified sufficiently through the mere elimination of the subject-spectacle? That is to make light of what could render them really effective, the realisation of the object, and, in it, the suggestions that, intentionally or by chance, it may evoke. For that is the crux of the matter. If we do not take the legitimacy of these suggestions into account and recognise that not only should they be accepted but that we should know how they can be provoked, then we show clearly that we have not renounced the classical mode, either in its spirit or in its means. We disguise the subject so that it will be unrecognisable. Nothing could be more contrary to the reason of the object than to take a classical figuration as the starting point and to distort it through a laborious series of operations which reduce it to being no more than a caricature of itself, or a flattened, geometrical schema. What does one hope to achieve by that? What serious advantage do we hope to gain by way of form through such stylisations? We fall into conventionalism, there can be no doubt of it, and the truth of the direction to be followed is more than compromised. But the appearance of certain figures, suggested, in an organism perfectly attuned to its objective reality, that cannot raise any objections among those capable of avoiding any misunderstanding as to the basis of the work. That they should prefer, in the name of the purity of the painting (and here I would be entirely in agreement with them) works in which no figurative allusions appear, nothing could be more reasonable. But they should know not to confuse what, though born in the natural ordering of the painting, nonetheless touches the memory with a sort of stylisation of the classical drawing which is consciously sought after and which, by that very fact alone, is anti-objective. When, in my third chapter, I sketched out the course that had been taken by the plastic researches of Cubism, I showed that, shortly before the painters had been enabled, by means of translation and rotation, to organise the object of painting freely, without any recourse to the figurative subject, a compromise was established between the new means which were becoming imperative, and the classical image, which persisted in wanting to stay in the painter's mind. This image was no more than the shadow of itself, its effigy or, more precisely, simulacrum. It bore no relation to anatomy or to naturalistic imitation. All that was needed was to notice the way certain elements were placed in relation to each other and to stress them, with a point for the eye, a vertical line for the nose, a horizontal line for the mouth, several wavy parallel lines for the hair etc. In this way, the image could be evoked, and sufficiently strongly to be able to hold its own in relation to the new, infinitely more important, fact that was coming into existence all around it. I thought it important to stress the distinction which should be made between this last manifestation of the classical image, and the first reappearance, by a road going in the opposite direction, of the 'sign of the image' in the picture-object. 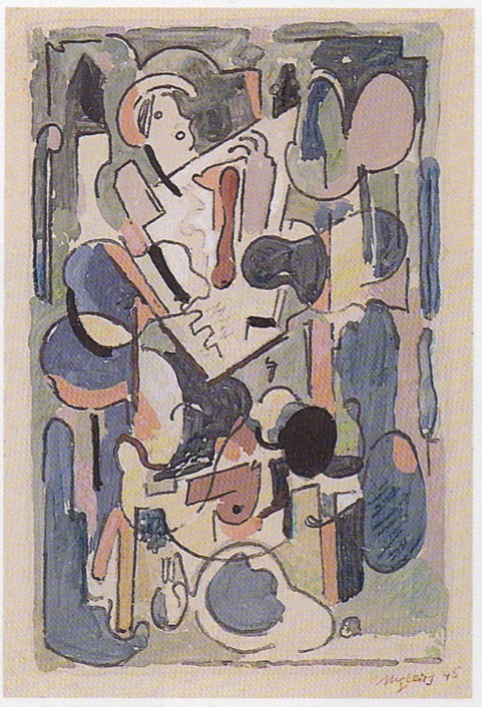 The sign of the image was born in the interweaving of the melodic lines of objective painting. Nonetheless, there is a certain analogy between these two images, so true it is that opposite extremes can resemble one another. The figurative sign in the picture-object too is suggested by means of points and lines, situated by virtue of certain relations that are sufficiently familiar to enable us to interpret their meaning and to impress it upon our memory. It may happen that, during the development of a theme, of a particular harmony in the translation, with the infinite resources that are offered by rotation when one knows how to manage it freely, one, or several, images appear, so to speak, of their own accord, in the supple game of the linear inflexions of the melody and counterpoint. If one has been very much struck by these sudden suggestions, I do not see why one should refuse to accept them and to endow them with an even greater intensity. Is it because the object is too weak to be able to take them in hand? Does it never have any right to a little fantasy? In again taking up the basis of the painter's craft, in returning to painting its laws and its measures, in refusing to make it tributary to the subject-spectacle and to all the subversions of subjectivism, have we, for all that, wanted to renounce the right to make use of those caprices of chance, those whimsical marks, whose suggestions will enable us to indulge a freedom that, surely, must be regarded as unquestionable? Have we finally decided that we are, forever, to be the Jansenists of painting? If, on the contrary, we acknowledge the legitimacy of using these propositions which are offered to us, without our asking, by a simple process of coincidence; if we can refrain from accusing the cloud of indulging in Naturalism just because its eddying evokes a figure in our minds, when it cannot, through its very nature as a cloud, prevent itself from moving and from forming different shapes - we can, by studying the conditions that give birth to these phantoms, learn how they work, isolate the chain of events, and become able to make use of them to turn the accidental into the willed. In this way, the picture-object, realised from a starting point that is quite opposed to that of the Humanist - man in action instead of man in submission - implies not only the problem of structures but, equally, that of the image. Who can do the greater can do the lesser, and this 'lesser' is neither to be despised nor ignored. The 'new realities', if they are to be well understood, must, necessarily, include everything which the old classical mode was able to do that was really useful in the social environment. And, in addition, it must embrace everything which it had not been able to do because of the limitations imposed by its status as a spectacle [sa limitation spectaculaire]. If, on the other hand, they think it sufficient that they have been derived solely from a non-figuration that has been achieved without reference to any sort of method, then we may reasonably suspect them of being nothing more than yet another spectacle or representation - spectacle and representation of our present day world, which abounds in destructions of what has been left to it by its pre-Humanist and Humanist past. The successive movements of our western world which have passed away, reduced to rubble by the rage for destruction that possesses all civilisations as they fall apart, they have all been devoted to the disfigurement of their own earlier figures. Does that make them new realities? Will they be even newer realities tomorrow, when the atomic whirlwind has been unleashed above them, and there is nothing left but dust? If the painters who have been tempted by the principle of non-figuration see in it anything more than a piece of escapism, an easy way of seeming to be what they are not; if they have enough humility to admit that everything needs to be learnt about their craft, restored to its rules after having been separated from its reality by several hundred years of deviation; if they are not fooled by the smooth appearances about them; - then they will make the effort that is needed for this reconstruction of Man and of the painter, and agree to respond to the various needs of the one and of the other - needs which differ according to the circumstances and which are separated into the grades of a hierarchy because they must not be confused one with the other in the order of their ascension. That the strictly 'non-figurative' work is at the summit of this hierarchy, that is not in doubt. But, again, this non-figuration must - I will never stop saying and repeating it - be order, not subjective negation. It will answer to the human need for dreaming, meditation, contemplation - for that disinterested poetry that touches those regions of the soul in which the spirit lives in consciousness of its own unconsciousness. Man, however, is not always able for those highest regions. They are accessible, but they are not usual. There are others equally honourable which should not be ignored or left infertile. The reality of the object is not diminished in them. It is there in its entirety, whatever about momentary fixations on figurative memories. These regions may be marked with points of rest that enable us to relax. At the crossroads as we advance along the way, the signposts which modify our activity slow it down for a moment, suspend it, without localising it, and the eye again takes up the course of the melody, follows the succession of cadences to the end of seeing the work finished in rhythm, in light.